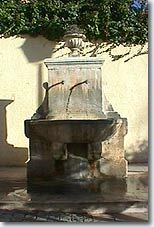 In Haut Var, on route D31 between Aups (10km.) and Carcès (16km.). Situated in the valley of Bresque, where the rivers Pelicourt and Grave come together, this small town is both an artistic and an industrial center. Salernes is set on the side of a hill and is sheltered from the wind. In this mild Mediterranean climate, it is pleasant to stroll about the narrow streets admiring the picturesque houses and the 11th c. church with its door and two spires. 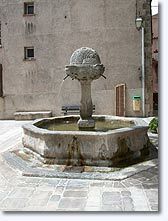 The many gurgling fountains are refreshing, and the castle ruins at the top of the village provide a view dov n onto the roofs and their round tiles. 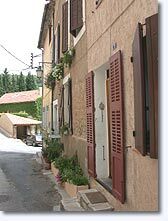 Salernes is famous for the red hexagonal tiles that one sees in nearly every Provençal house. They are made of terracotta, glazed or not, and all come from the rich red iron filled soil of the area. There are 15 very creative factories that offer their products, famous the world over. Castle ruins. St. Pierre Church. Walking or horseback riding tours. 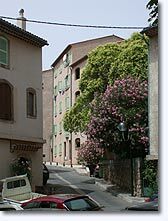 Entrecasteaux (8 km), Sillans la Cascade (6 km), Villecroze (5 km) and Cotignac (12 km).